A new podcast dedicated to Liverpool band The Beatles has been launched, bringing fans the story of how the Fab Four shook the world and released some of pop’s greatest hits. There will be 10 episodes in the series called ‘Beatles City, including interviews with people who were there as the group rose to fame as well as those who have insight into the time. The Liverpool Echo is behind the podcast, which will feature a range of people, including former Beatles drummer Pete Best and manager Brian Epstein’s secretary, Freda Kelly, who also ran the original fan club. Best talks about his time in Hamburg with the band, plus when he received the devastating news he had been sacked, while Kelly discusses her close relationship with John, Paul, George and Ringo. The podcast will be hosted by Laura Davis, the Liverpool Echo Arts Editor, and Ellen Kirwin, the newspaper’s What’s on writer. Laura told JMU Journalism: “Everyone in the city has a Beatles story and a different experience. The podcast aims to spotlight different places and paint the city in a good light. “I learnt loads of new things. 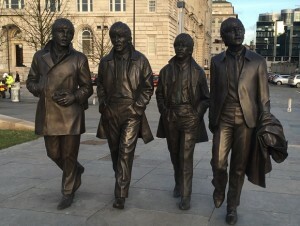 I didn’t know that the statue of John Lennon on Mathew Street has had three different heads. Also, Freda Kelly hasn’t really spoken about her time with The Beatles so everything she told us is new information. Beatles City is available on iTunes, Acast and other podcasting apps.